There are only 3 regular polygons (polygons with equal sides and equal inner angles) with which you can park a surface: the square, the equilateral triangle and the regular hexagon. Just as the Pentomino and Hexiamond laying games were derived from the square and the equilateral triangle, it is obvious to construct a corresponding game by combining several regular hexagons. By joining 2 hexagons you get only one piece. If you put 3 hexagons together you get 3 different trihexes. There are 7 tetra- and 22 pentahexes. Since 3 pieces are too few and 22 too many for a puzzle, the tetrahexes can be used as a basis for a laying game. 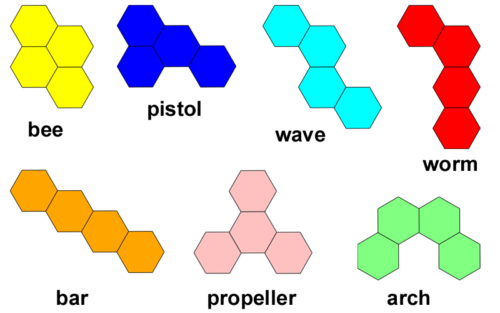 As with the Pentomino and Hexiamond, the Tetrahex pieces were given names for better differentiation, as shown in the illustration. A figure made of all 7 Tetrahex tiles consists of 28 individual honeycombs. 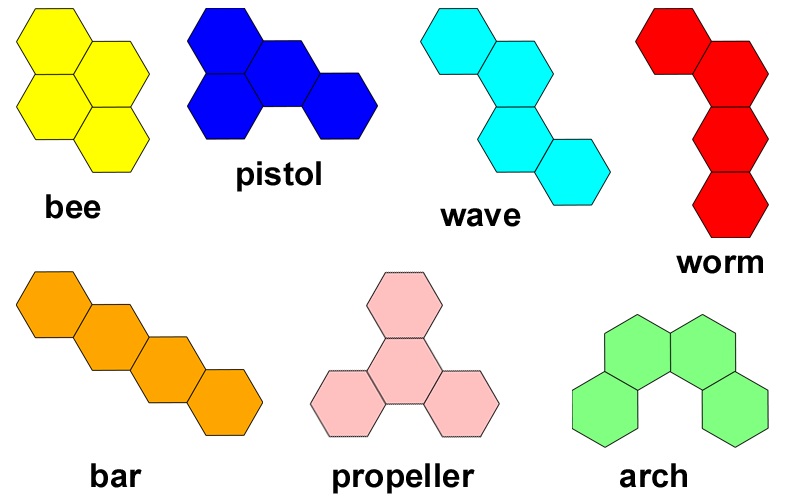 There are many figures that can be laid with the 7 Tetrahexes, but no regular hexagon. If you extend the set by the 3 trihexes, you can lay a hexagon with side length 4 with the 10 tetrahexes. The disadvantage of this extended piece set is that there are a lot of solutions for most pieces and so it is not very difficult to find a solution. For example, there are 12290 different solutions for the hexagon. Just like the Pentomino and Hexiamond tiles, the Tetrahex tiles can be made out of cardboard. Templates for the Tetrahex pieces are available for download. 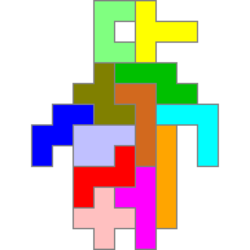 To create and solve Tetrahex figures I have provided the solution program Tetrahex on the download page.